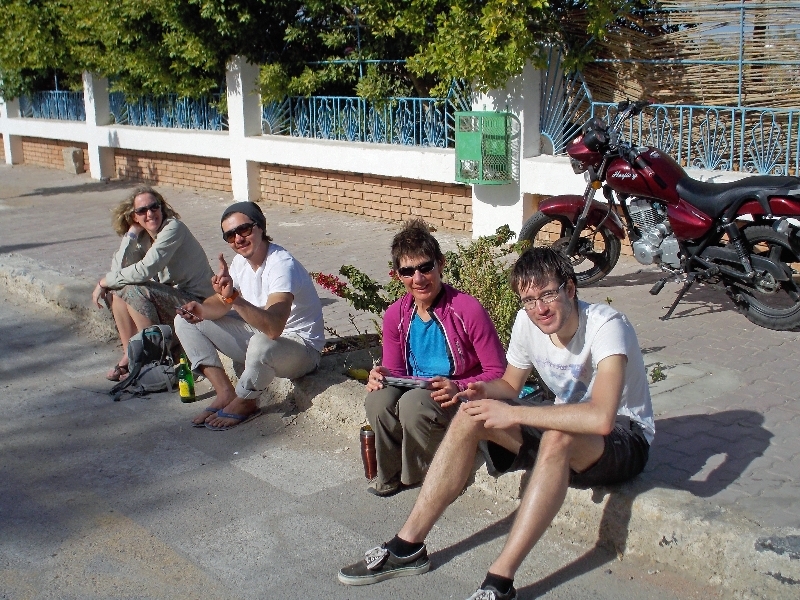 Today we cycled to resort town of Safaga. 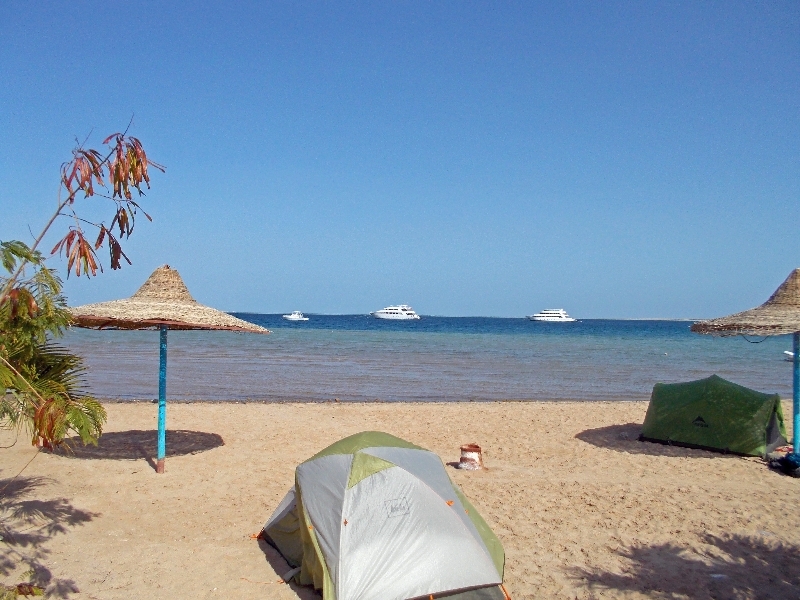 I am still camped, but on the beach with nice view of the Red Sea. There are also some who reserved a room, but I’m fine camping for now. Today was a shorter day with only 94km. We had some cross winds and even slight ride into the wind, but overall we’ve been fortunate that today as other days we’ve had more tailwinds than headwinds. On our fourth day, we’ve gotten our rhythm as a group. The sunrise is shortly before 7am. In principle, a wakeup toot on the horn is at 6:30, but most people are up before then. Next task is getting gear packed up, wearing cycling clothes and bringing bike and everything ready. A good breakfast of porridge, granola, banana, tea, etc and then we’re on the road. There is a “race” as part of TDA and the racers have little device to punch in and punch out to record their times. Many of us also have those devices to clock in/clock out and technically will get listed as racing, but this is more keeping track of time. I tend to ride by myself occasionally meeting with others, though there are also groups that ride together at similar pace. 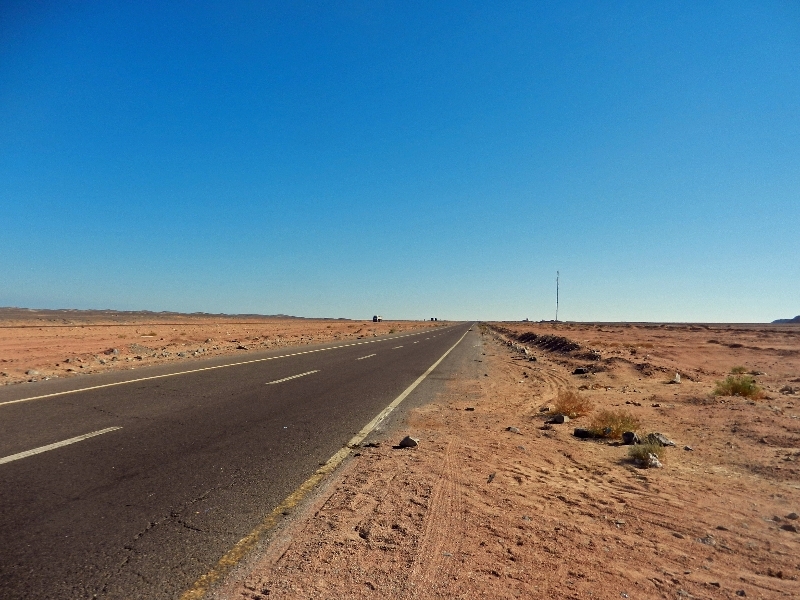 The riding so far has been straightforward, the roads are fairly smooth with only occasional flats with glass. We’ve had favorable winds. The landscape is dry desert with Red Sea appearing occasionally on our left. There are some oil derricks and signs of pipelines and pumping stations. The sun is mostly shining and good to keep chapstick and sunscreen on. Somewhere around half way, there is a lunch stop. Pita bread with various types of spread along with a chance to top up on water. After that another check of the white board and once again on the road. Still some more riding along the highway until I come to camp. Once at camp, first step is to click in for my time on “race”. Then find my bag and a good place to pitch my tent. Soup is on and frequently hits the spot. Depending on how long the ride was, hang around and talk with other riders or just get everything set up. Around 5pm or so, we have a “rider meeting” where we review highlights as well as the upcoming days ride. After that, dinner is served. I’m not going hungry on the trip, though burning through some calories riding. After dinner it gets dark early. Also gets cool in the desert. So get into the tent and do some reading, perhaps check cell phone for internet connection and otherwise relax and get ready for another day. Today it will be nice to wander around this little town, see what else is here. 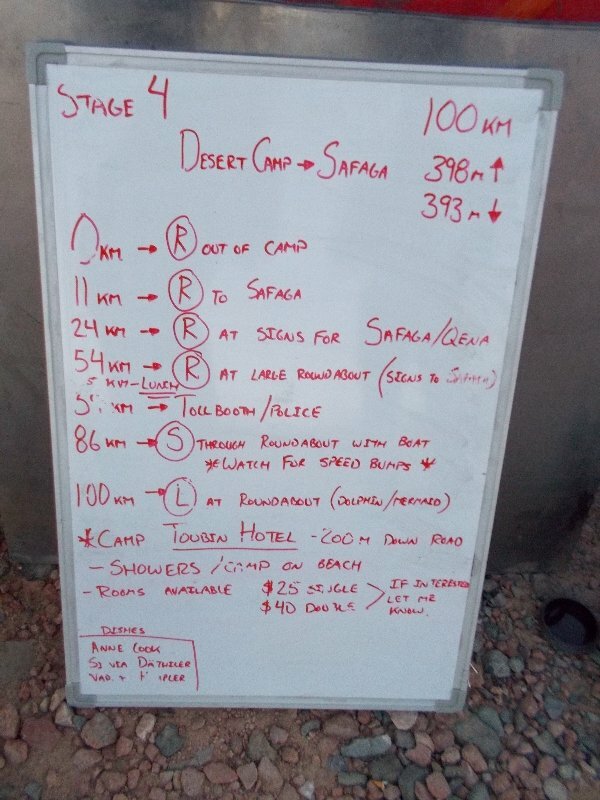 We’ve got two days of riding from here to Luxor and a chance to be a real tourist as well as an official rest day. I’m sure our fortunate luck with winds will shift and this will become a bunch more challenging, but so far first four days a good chance to catch our rhythm and get started with the trip.